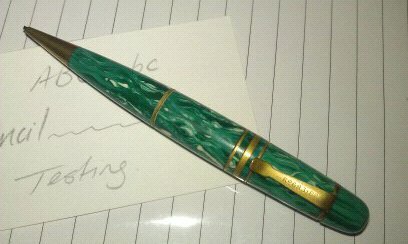 I acquired this cute vintage mechanical pencil and am trying to decide whether to keep it or put it on ebay. I believe it’s from the 1930’s and it probably has an interesting history. I love the way it looks, and despite it’s small size it feels comfy in your hand when you write. I really don’t use a pencil that much though so it would probably just sit around on my desk gathering dust. Decisions, decisions! This entry was posted in Stationery by Sammie. Bookmark the permalink. That is a pretty pencil! I don’t like using pencils too much, either. If you decide to put it up for sale, let me know. I have a pen pal who is a pencil enthusiast!